Tonight, April 18th at Barley Brothers Stadium, The Parallel 49 Brews Bros Vol. 2 Launch Party is happening. This event will be starting at 6 pm. Come down and say hello. I’ll be there. All 12 beers from this collaboration pack will be on tap down at the Stadium location of Barley Brothers (Pembina Highway location). As this is a launch party for the collaboration pack, it means we will be seeing this 12 pack show up in liquor marts here in Manitoba. The list price is $29.99 ($5 cheaper than last year) and more details about quantities at Liquormart locations can be found here. The 12 pack will be arriving on April 20th. Not your typical beer. Start with an Imperial Pilsner recipe, throw in some rice and Sorachi Ace hops, add Sake yeast and Brettanomyces clausenii, and just for good measure put in some oak spirals aged in Chardonnay and Sake. Don’t forget to finish it with lager yeast. Seem too complicated? No comment. With origins in Northern Germany, this dark cool fermented ale has been turned up to 11 with some chocolate malt notes and a prominent noble dry hop. Continental Pilsner malt ensures a refined and highly drinkable beer that is deceptively strong. A traditional Golden Strong Ale. Spicy and fruity yeast derived notes add a rush of Belgian character to this golden elixir. A healthy addition of sugar to the pale malt base results in a deceptively light body for a higher alcohol beer. Inspired by Export Stouts and rum, the dark crystal malts and touch of molasses serve to remind the drinker of the later. Oak spirals aged in Havana Club 7-year old rum add another level of complexity to this surprisingly smooth drinking dark tawny ale. A Helles Bock that would infuriate any German beer traditionalist. A core of Continental pale malts book-ended with a touch of black malt to give it an imposing colour and a hearty dose of Hallertau Blanc hops to add a bright gooseberry aroma. A fruity malty lager that is surprisingly dark. The love-child of Jerkface 9000 and Nectarous we’ve been waiting for. A wheat malt base kettle soured a la Four Winds, and late hopped with Mosaic and Ahtanum hops in the Parallel 49 style. A true marriage of techniques and ingredients results is a pungent dry-hopped sour. A snakebite inspired beer, using a witbier base fermented with a Saison yeast. Spicy yeast and floral citrus notes sit atop a light apple tinged wheat malt base. Dry hopped with Motueka and Citra because… well… why not? A rustic and uncomplicated Black IPA. Simcoe hops are made for a beer like this. A moderate malty base, a touch of Roasted Barley flavour, and a restrained ABV make this a beer you’ll be coming back to again and again. A rich and malty ale with a substantial rye note was fermented with Brettanomyces lambicus to add a cherry funk. This all-malt beer uses earthy hops to balance. This beer doesn’t hide its alcohol or the spicy cherry character that it developed. Playing off of the woodsy resinous flavour of Black Currants, this American sour wheat ale hints at the summer to come. Brace yourself for this tart fruity treat that has perhaps the most stunning colour of any beer we’ve ever seen. A gruit spiced with organic heather flowers, juniper and dry “hopped” with fresh ginger. This mild rye ale focuses on the spicy ginger and juniper, reserving the heather for a background note to support the rich organic Munich malt base. Maybe hops aren’t necessary in every beer. A classic Saison with a dose of rye malt to throw in some complexity. Taking advantage of the fruity herbal aroma of Opal hops and the spicy pepper notes from the farmhouse yeast. This is sure to be a thirst quencher. Parallel 49 will also be sending us Gypsy Tears and Jerkface 9000 in 473ml cans and a dry-hopped sour ale called Bodhisattva. Keep your eyes to the Liquor Marts new listing page. It also looks like Manitoba Liquor and Lotteries will be doing the Coast to Coaster again and there are a couple of new breweries on board for this event. Fuggles & Warlock from BC as well as a German Pilsner and a French Schwartz Beer. Keep your eyes open for this. Hey folks. Wanted to take a moment to write about a few craft beer related events coming up in the immediate and near future. This won’t be a long post but I hope that people will take advantage of the opportunities to get out and try some new craft beer/support local establishments. First, tonight (March 31st, 2016) at 7pm, PEG Beer Co. will officially open its doors to the public. This has been a long time coming and it is so satisfying to see them open their doors. Almost a year ago I first wrote about the plans behind this brewpub and more recently gave an update on where they are at. With all the delays and all of the hard work put in by the team, to have them open is very exciting indeed. I hope that this will just be the start and we will be welcoming Barn Hammer, Torque, Oxus Brewing and others over the next year. As I’ve said before, I’ll say again, Winnipeg’s craft beer scene is going to be vastly different next year at this time. Second, on April 18th at Barley Brothers Stadium, The Parallel 49 Brews Bros Vol. 2 Launch Party is happening. All 12 beers from this collaboration pack will be on tap down at the Stadium location of Barley Brothers (Pembina Highway location). As this is a launch party for the collaboration pack, it means we will be seeing this 12 pack show up in liquor marts here in Manitoba. The list price is $29.99 ($5 cheaper than last year) and more details about quantities at Liquor Mart locations will be coming on the Liquor Mart website as we get closer to the date. This is just the start of the beers that we will be seeing come into Liquor Marts from the 49th Parallel group. They’ve got Rogue 4 hop coming out later this week and it looks like it might be getting bulletined as one of their new core products. As well, waiting to come into Manitoba is Phillips Sax (Dark Sour Brown Ale aged on grape musts), Rogue Sriracha Stout, Rogue Brutal IPA as well as a taste of my home town, Picaroon’s Timberhog Stout. Not sure on the date these will be coming out, so watch the Liquor Marts new listing section. Finally, for those who homebrew, there is a Pros vs Schmoes competition coming up on May 28th. This is put on by Grain to Glass and Le Beau Café. The best of show beer will have their beer brewed at Barnhammer after it opens. There will be some great prizes and it’s a great opportunity to get your beer judged by certified BJCP judges. It’s a great way to get some feedback on your homebrew and to have an opportunity to win some great prizes. You can get all the details you need by clicking here. You can also register by clicking here. Well apparently I haven’t been able to do one a day. I guess that was a little ambitious given that it was a long weekend and I was travelling. As well this week is a crazy work week so I would not expect to be able to post much until it’s over. So, this post will have to carry you through. 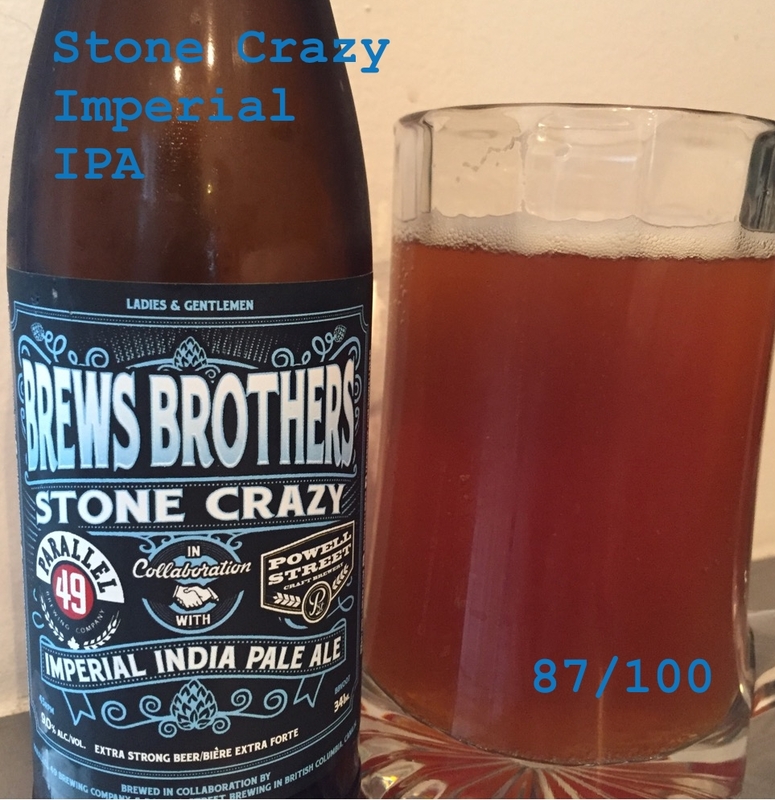 Today’s Brews Brothers Beer is called “Stone Crazy” and it’s an Imperial India Pale Ale done in collaboration with Powell Street Brewery. I’ve already gone over who Parallel 49 Brewing Co is and I’ll just take this moment to thank them for their great mixer pack. You’ve brought together a great pack of collaborative beers. So, who is Powell Street then? Powell Street Brewery is aptly located on Powell Street in Vancouver BC. They don’t post a lot of details about their brewery on their website in respect to who founded it and why. What they do tell us is that they are a 4500 sq ft brewery capable of 17.5hl micro brewhouse with a 3.5hl nano brewhouse as well. They sell a number of different beers ranging from Pale Ales to Porters and do growler fills, glasses and bombers right out of the brewery, something I hope we will be able to see more of here in Winnipeg. The beer that they’ve done in collaboration is named Stone Crazy. This entire pack is blues themed and this name comes from the song Stone Crazy by Buddy Guy with his soulful guitar rhythms and voice this beer really captures the smooth and soulful feel of this song. Essentially what we have here in an Imperial IPA is a double IPA. The names are fairly synonymous. The term Imperial tends to come from the Russian Imperial Stout, a style of strong stout that was originally brewed in England for the Russian Imperial Court. Double IPA tends to be the most common/preferred term and essentially indicates that you have an incredibly hoppy beer on your hands with high alcohol content and good robust malty balance. IBU on these beers tend to range from 50-120 (although 90+ it’s hard to tell the difference) depending on the brewer. Let’s get to the beer! Appearance: Cloudy golden brown coloring with a good 1” head that retains well. Some sediment at the bottom that needed to be left behind. Smell: Hoppy, citrus (pineapple at the front with some lemon and some orange) with some sweetness coming through on the backend from malt (some caramel notes). Taste: Not as big and bold on the hops but not necessarily a bad thing. The hops are definitely there with the sweetness of the malt backbone bringing in some caramel notes to give this particular Imperial IPA a smooth and well balanced taste. The hops bring in their resinous citrus tones to blend in with that caramel malt to give you a dangerously easy to drink 9% ABV beer. Mouth feel: Good mild carbonation with a smooth mouth feel. Overall: Nice and smooth double IPA. Alcohol content is at 9% but not noticeable in this beer. Sweetness is great to and blends well with the hops which don’t assault the taste buds letting you enjoy all the complexity in this beer. Overall a very strong double IPA. Do I like it: Yep. Big fan of this one. I love IPAs and this one is well balanced and smooth giving a drinkable double IPA that brings some nice hop bitterness that isn’t overpowering. Very tasty. Alright folks, so I picked up the Brews Brothers 12 beer collaboration pack. 12 beers from 12 breweries. I’m going to do my best to try and write up a review on all of them. I can’t promise it will be daily, my day job is keeping me nice and busy these days, but I will do my darnedest. Parallel 49 is a brewery that spawned out of three friends love for good beer. Mike, Nick and Anthony all grew up about 10 minutes away from where the brewery now stands. Having been avid home brewers and lovers of good craft beer, these three friends quit their day jobs in 2008 and opened a restaurant which quickly became known as a mecca for good craft beer in Vancouver. Wanting to put their money where their mouth was and stop talking and start brewing, they partnered with Graham With, a respected Home Brewer, and Michael Tod, a friend who had the business savvy and experience in the Vancouver craft beer industry, the Parallel 49 brewing team was born. This particular collaboration is done in conjunction with Bomber Brewing. This small mico-brewery opened in February of 2014 after three good friends put their love of hockey and beer into practice forming a committed crew together to make good beer. Don Farion, an award winning home brewer, brought not only that talent but 20 years in the hospitality industry together with Cam Andrews’ 20 years of design and marketing experience to create a brand that was unique and stood out from the boom of the craft breweries opening in Vancouver. The head brewer Blair Calibaba brings experience working with Ambleside Brewing as well as 11 years of experience running a brewery to the table as well as his knack to create accessible and approachable beers. 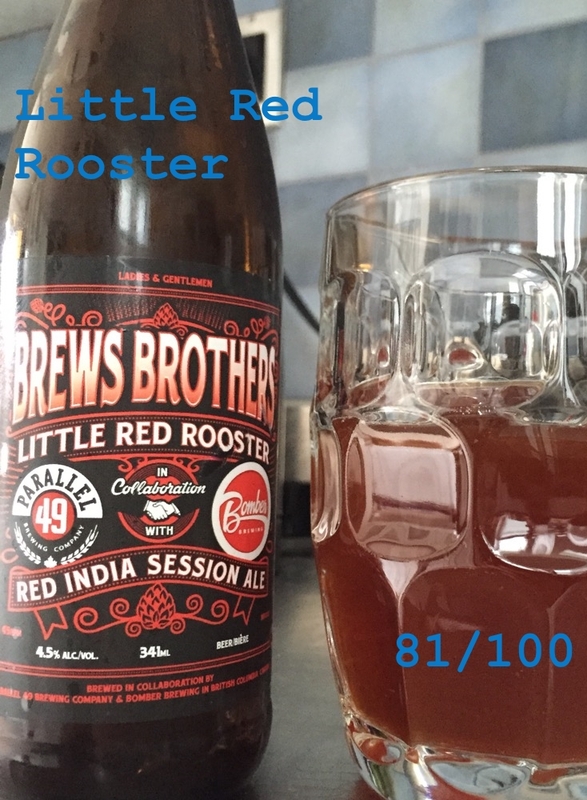 Together these two breweries have created Little Red Rooster, a Red India Session Ale. Session ales are essentially any beer that contains no higher than 5% ABV and features a balance between the hop and malt characteristics and, typically, has a clean finish. According to Beer Advocate the term session likely referred to one of two allowable drinking periods in England that were imposed on shell production workers during World War 1. The fact that they were highly drinkable allowed for these workers to consume multiples during their allotted time period. Today, sessions used to refer to beers that meet the criteria but could come from a variety of different styles. This one, for example, is an American IPA. Different from a standard IPA and more flavourful than a British IPA it ranges in colour from pale golden to reddish amber. The hops can tend to have a big herbal flavor or citric notes with a good malty backbone. This one, as a red session, is the amber in colour and brings some nice herbal and citrus notes in the hop with a smooth balanced malt at the end which eliminates any lingering bitterness. Appearance: Cloudy reddish amber color with a 1” head that dissipates quickly leaving a lingering foam. Smell: Citrus and some herbal smell which I can’t distinguish but is almost like spruce or pine. Taste: Good citrus on the front with a refreshing bitterness that doesn’t linger long. Fading at the finish into the malty sweetness with only a slight lingering taste of tannins making for a dry finish. Mouth feel: Light carbonation, smooth drink, dry finish. Overall: Very nice. Good balance of the hops and malt. More hops would likely showcase the style of beer more but given the accessibility and approachability that bomber goes for that wouldn’t be in their style of brewing. The lower alcohol content is offset by the good hop/malt balance making for decent, if not delicious beer. Do I like it: I do like it. It was a good beer to start with and I think that if this is a sign of things to come that this will be a very good collaboration pack. To be fair, this isn’t anything to write home about. Falling within my Good range, it was good and I’d certainly be happy drinking it again. Thanks for continuing to follow along with my blog. I’ve got an interview with Matt Wolff at Fort Garry scheduled so looking forward to getting that up in the next couple of weeks! Keep checking back, I’ll be trying to post more about the Brews Brothers mixer pack.